Teachers in collaboration: Leena Valkeapää (Aalto University), Anu Osva (Finnish Bioart Society), Tuula Häyrynen (Finnish Bioart Society), Maria Tuomi (research assistant Kilpisjärvi Biological Station) and Oula Kalttopää (laboratory assistant Kilpisjärvi Biological Station). The intensive course “Arctic journey in the cross-section of art and natural science” was arranged for the art pedagogy students of Aalto University School of Arts, Design and Architecture, in cooperation with Ars Bioarctica. 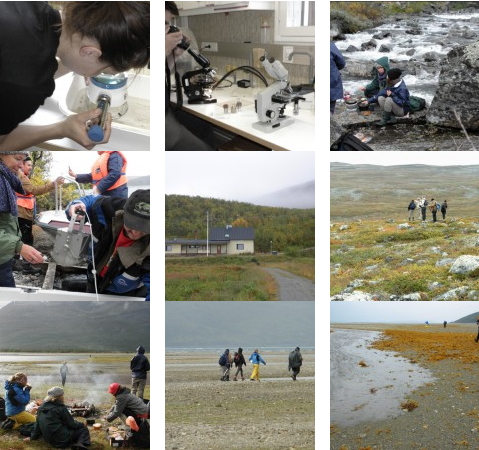 The main targets of this workshop were first to find one’s own way into the Arctic scenario by relating to the Arctic nature, and second to study or investigate the art&science orientation in bioart together with the learning group of students, experienced artists and pedagogues.